The forrested country of Latvia is nestled between its neighbours Estonia and Lithuania just off the Baltic Sea. The small country's picturesque towns and ancient cities are set within a landscape of plains, lakes, forests and river valleys. Fishing villages interrupt the dramatic coastline interspersed with white sandy beaches. 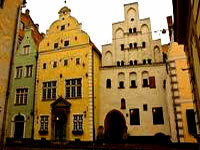 The country has many manor houses, medieval castles, palaces, and ruins. The capital city of Riga, the beautiful capital, is rich in history and culture with the largest concentration of Art Nouveau buildings in Europe resulting it being declared a UNESCO World Heritage Site. The Latvian capital is an obvious tourist destination as the largest city in the Baltic States and a major port home to almost half the country's population. Nearby, the Baltic health and recreation resort of Jurmala doubles its population during the summer months as a popular holiday destination, with its sandy beaches, healing waters, mud baths, and quaint wooden houses. History lovers will enjoy the ancient cities of Valmiera, Cçsis, and Limbaþi in the northern region, which were once members of the Hanseatic League. The picturesque cultural towns of the Abava River Valley and the villages of the ancient Liv people in the south are also worth visiting. The Rundale Palace is a popular sight along with the spectacular Baroque palace at Jelgava in the central region of Zemgale. Lastly, the scenic Tervete forest, with the oldest and tallest pine trees in Latvia are not to be missed. Those keen on outdoor activities will enjoy the natural surroundings in the Latgale region otherwise known as the Land of Blue Lakes; the coastal landscape of the Kurzeme region, where deserted beaches stretch for miles; and the coastline and hilly scenery of the northern Vidzeme region, which also is home to Sigulda, the country's downhill skiing area. We are looking for contributors for our Latvia travel guide. If you are a local, a regular traveller to Latvia or a travel professional with time to contribute and answer occasional forum questions, please contact us.